Genesis offers Cirrus owners with a complete range of training services from initial and recurrent instruction to advanced instrument procedures training. We also offer accompany services to get you proficient in your new aircraft while flying actual missions. You will train with experienced Cirrus instructors in a one-on-one environment tailored to you. Whether you’re already a Cirrus pilot or just getting started, we offer a course specific to your needs. For Cirrus customers who elect not to travel to the factory or another destination to accept their airplane in person, Genesis offers an Acceptance Service. A Genesis Cirrus instructor will sign the appropriate paperwork and conduct the aircraft inspection on your behalf as well as deliver the aircraft to you. An experienced Cirrus flight instructor may more easily identify aircraft discrepancies that may otherwise be overlooked. To help familiarize you with your new purchase and provide an increased level of comfort with your aircraft during the trip home, Genesis offers an Accompany Service. 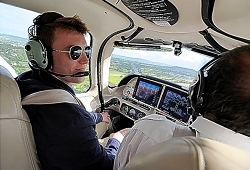 As part of this service, a Flight Instructor will travel with you to your home airport. In addition to the increased feeling of security, the Accompany Service may be combined with our training programs to jump start your progress toward certification that may be required by your insurance company. Often combined with our Acceptance Service, Genesis offers Delivery Service for Cirrus customers who elect not to travel to the factory or another destination to accept their airplane in person. A Genesis Cirrus instructor will deliver your aircraft to you. At Genesis Flight College, we can help residents of Collingwood, Toronto, Barrie, Aurora, Brampton, Caledon, Markham, Newmarket, Richmond Hill, and Vaughn, Ontario receive cirrus training. Cirrus aircrafts are the pinnacle of what General Aviation flying means today. Features such as advanced composite technology, state of the art avionics, unparalleled safety features, ease of operation, and speed have made the Cirrus SR22 the best selling airplane in its class for the past 9 years. Genesis Cirrus flight training is designed to prepare pilots for the challenges of safely and efficiently travelling thousands of miles in a single day, across multiple weather systems and through many types of airspace and terrain. Today’s pilot needs to be thinking about these challenges from day one and incorporating the required skill and resource management into every flight lesson.